A = Price drives higher from the open. It pauses (smaller range candle at the top). I'm watching the lower timeframe for potential opportunity to enter LONG for continuation higher. B = Nope… the market drops lower. C = Price drives lower. Again, I'm watching the lower timeframe for early signs of potential opportunity to enter SHORT for continuation lower. D = Nope… the market pushes higher. At this point, we have the start of a broadening formation. Certainly one of my least favourite environments from a market open. At this point, I need to step back from the chart a little to avoid any impulsive action. It could well continue for another few legs. I am NOT ALLOWED to act unless I see some form of partial decline or partial rise. E = Price pushes higher. I'm not interested. F = Price pulls back and stalls. One candle. Two candles. It's finding support. This is a potential partial decline. Now I'm interested. G = Take the PB trade opportunity for continuation. Manage aggressively. It needs to break to new extremes, or you have to get OUT OF THERE. A broadening formation is a sequence I have struggled with in the past. 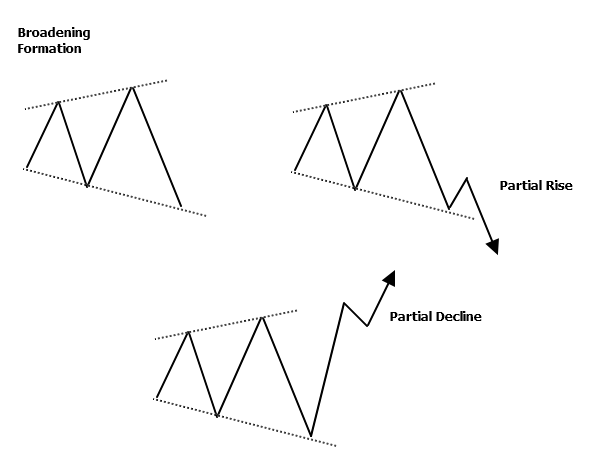 I recognise a potential broadening formation through rejection one way and then again the other way. The best way I have found to manage this situation is to stand aside until recognising either a partial decline or partial rise. One of my favourite technical analysis concepts – volatility contraction leads to volatility expansion. 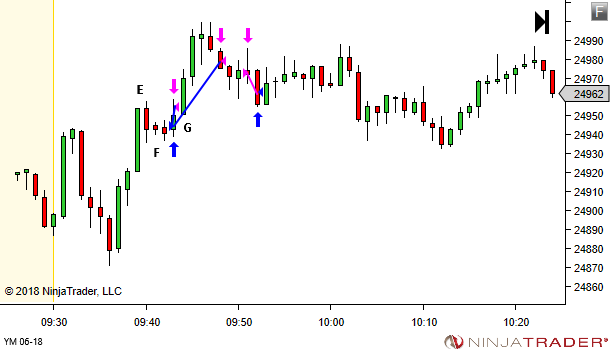 Let's look at a higher timeframe (60 minute chart) example. In both cases the gap open led to a strong trend for several hours. Higher timeframe volatility contraction can lead to highly directional trading sessions, when the open gaps beyond the pattern boundary. 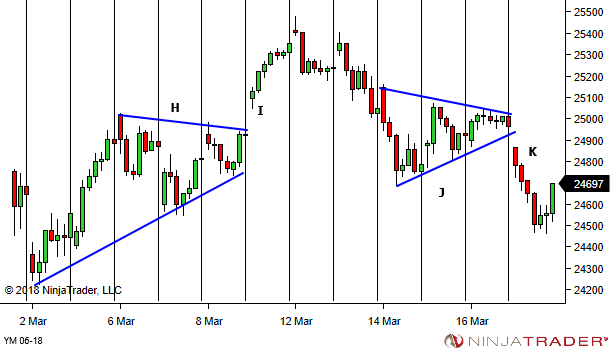 Watch the TTF opening range for confirmation of potential continuation. On a confirmed break of the opening range, anticipate a trend day UNTIL PROVEN OTHERWISE. A ridiculously fast and long bearish price swing (A). Price just collapsed. 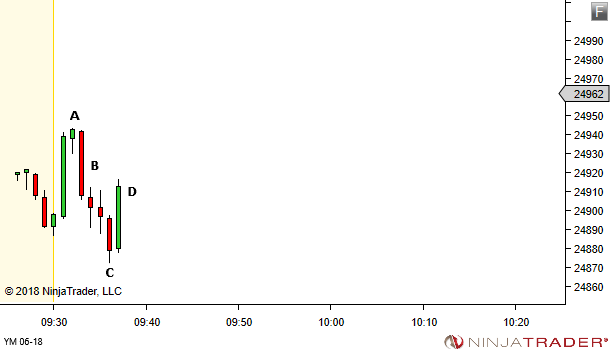 Note also the massive increase in volume (B), proving eventually to be the highest volume of the day. Price then stalls for half an hour (C). Whatever caused the momentum drop is clearly no longer driving sentiment. Price breaks the low at D. Surely expectations are for continuation lower? Well, that's what many will expect. But those familiar with my writing will know that, while I'm ready for that potential, I'm more excited by the potential for the break to fail. Obvious expectations OFTEN fail. And that failure can provide nice opportunity in the opposite direction. Area D offers some beautiful price action to trigger BOF entry LONG. Lower tail rejection. Stall with an inside bar. A tiny break of the low of the inside bar. Then compression against the level and eventual break higher. Step through the candles following the break lower at D and place yourself in the mindset of anyone who might have entered SHORT on the break down. Feel their emotion as price stalls. And stalls. And stalls. This is how you play the metagame – playing against the other traders who find themselves stuck in the market and subject to extremes of emotion. Whenever you find any price occurrence which suggests OBVIOUS expectations (especially in accordance with standard technical analysis), pause and ask yourself the following question: "What if it doesn't?" Obvious expectations CAN and DO fail. This failure can provide good trade opportunity and good trade conditions in the opposite direction. 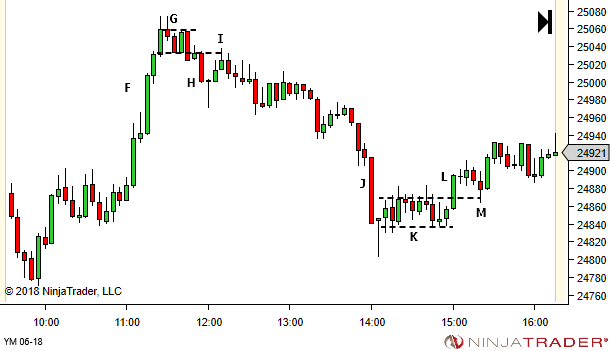 G = The strong bullish drive is unable to continue, settling into a tight sideways congestion. H = Strong drive down. I = Opportunity available on a retest of the tight sideways congestion. K = The strong bearish drive is unable to continue, settling into a tight sideways congestion. L = Strong drive up. M = Opportunity available on a retest of the tight sideways congestion. Watch for a potential top or bottom when a very strong bullish or bearish drive suddenly stops and fails to continue. 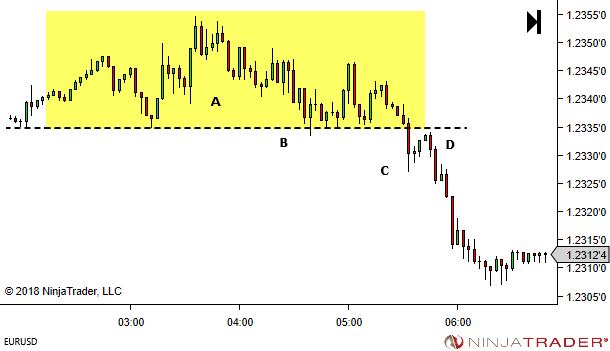 If a top or bottom pattern forms as a tight sideways congestion, with a subsequent strong break from that congestion, look for trade opportunity on any retest. 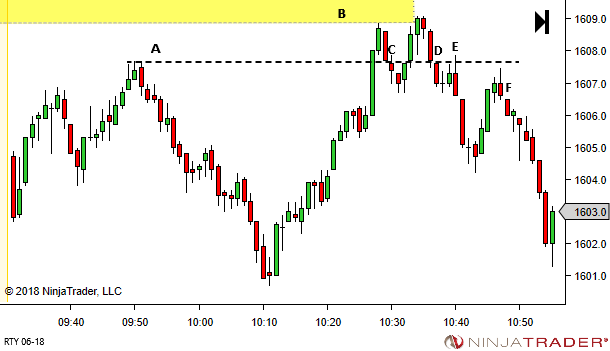 Price breaks the high of day (A) right into an area of overnight-high resistance (yellow shading B). Regardless of whether you consider this setup a BOF of A or a TST of B, it's a good reminder that reversals are not always a single-touch V-turn. Entry at C would at best be scratched for breakeven or very small profit. Re-entry would be required at D.
Further potential opportunity is available through the engulfing candle (E) or the retest of the breakdown at F.
If you miss a trade setup, remain patient. There is often (but not always) another chance to enter. 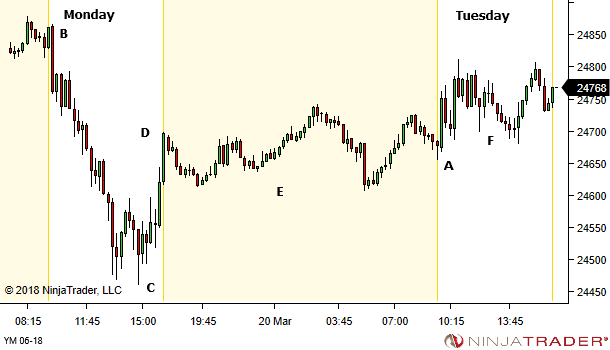 Price finds some support around 11:30am and settles into a period of sideways contraction (H). The contraction itself offers no real clues in terms of strength or weakness of either side. It can't go up. It can't go down. Wait. Be patient. Seek opportunity SHORT in the yellow shaded region (I), once price has broken the volatility contraction pattern. While there is potential for a trap, all effort should be made to trade these. 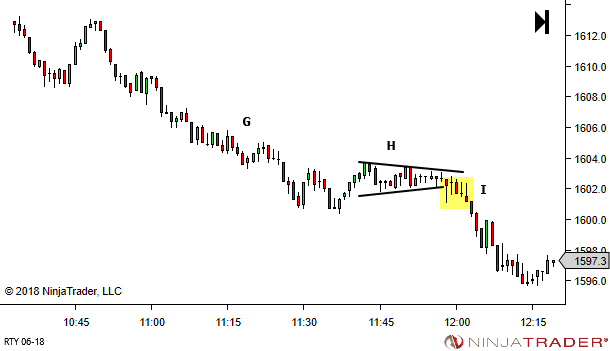 The risk is often minimal, especially if the breakout occurs very close to the apex of the triangle. And the potential reward is often multiple-R.
A trap and reversal to rally through the upper boundary of H could be considered for entry LONG, should that occur. Volatility contraction leads to expansion. Always seek opportunity on a break from the area of contraction. A bonus extra one for today – a place where my expectations were wrong! 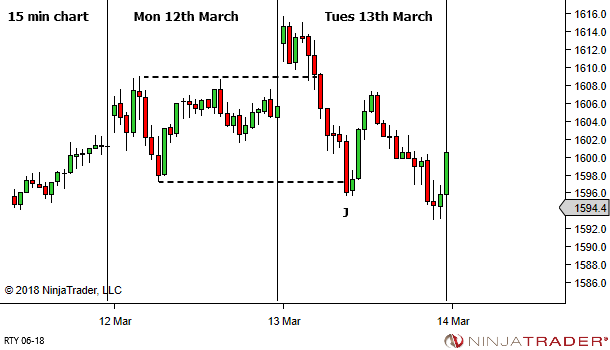 The 13th March opened above the prior days high and moved through the full prior day's range to break the low at J. 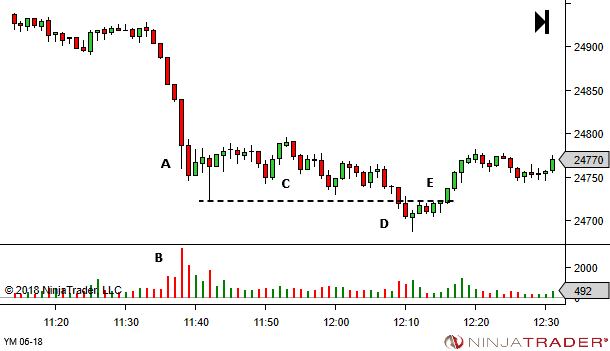 My expectations following an engulfing of a prior day's range are for price continuation lower. Instead, the breakout proved false and price rallied back within the prior day's range, providing very smooth and easy-to-read bullish price movement. The market cares little for my expectations. It goes where orderflow tells it to go. As always, some of the best signals come from failed expectations. If I'm stopped on any breakout pullback entry SHORT, get over it. There is potentially now even better opportunity for a breakout failure entry LONG. Find it and take it.